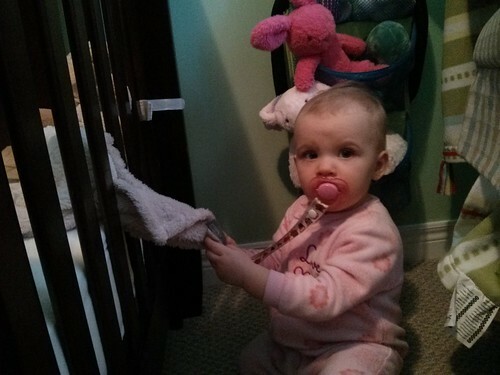 Posted on February 3, 2014 Posted in 2014, Baby, Musing Monday, NL, Parenting	. It’s been a busy few days. Not because of social engagements or volunteer commitments (although both are often enough to keep us going). No, instead we’ve been dealing with teething (of the molar variety) and some sort of viral thing that’s left Missy Moo feeling pretty miserable. Posted on January 27, 2014 Posted in 2014, Baby, Food, Musing Monday, Parenting	. I’m going to try and post more recipes that I’m cooking/baking for Missy Moo. Most of the recipes are perfectly fine for us adults to have, the only real difference I’ve noticed is that they often have less sugar and while there are often some tasty flavours, there isn’t anything too crazy or spicy. For the most part, we give little miss some of whatever we’re eating. But on days when we’re having spicy Thai curry or something she may not be ready to sample, we’re trying out some new things. Oh and don’t for a minute think that I’m making everything she eats. There are some great pre-made stuff that’s convenient and not completely terrible (as in, there aren’t a lot of of preservatives and there are littler or no chemicals). So if you’re not making things for your little one, don’t feel bad. I’m confident it will not traumatize them and leave them full of hostility when they’re adults. Posted on January 20, 2014 Posted in 2013, Baby, Family, Musing Monday, Parenting	. Parents are often their own worst critic. Whether it’s mommy guilt, paranoia of what strangers think, or having someone you know roll their eyes because of some quirky parenting thing that works for your family. But sometimes you’re in a situation and just roll with it. Now what I’m about to describe is by no means epic or something to be documented for the ages, but it’s something I’ll remember and it’ll probably happen again and again. A couple of weeks ago, Missy Moo and I had a pretty busy Friday. She managed to have a short morning map, but it was clear she was still a very tired baby. Posted on January 13, 2014 Posted in 2013, Baby, Musing Monday, Parenting, Products	. Growing up, I had a favourite blanket named Blue Pink (although it was actually more green and not very blue or pink). It had a flannel-like feel and I literally rubbed the flannel away. I still have it somewhere and I’ll be dammed if I’ll ever throw it away. Blue Pink and I are together for life. Most kids will have a lovie or something that they cuddle and sleep with. We wanted to encourage Missy Moo to have such an object because it can help with self soothing. Bunny is very important. He has a couple of tags still attached that apparently are very tasty (this is entirely my child’s observation, I have yet to see for myself). He’s soft and cuddly and we have a pacifier (nummy) that’s attached to him with a clip made by our talented friend Christina. Check out her Etsy shop! I have a secret. We actually have two bunnies. But we really need at least one more. If we ever lose one, there could be trouble. Normally, Bunny lives in the crib, but often goes out for trips in the car (he really loves the car). But he doesn’t come out and play during the day (he’s a bit shy around others). Look who just found Bunny? Unfortunately, he’s behind bars. Over the last few weeks, we’ve been struggling with naps and bedtime. Apparently sleep is so not cool with the kids these days. Little miss actually gets quite mad. It’s pretty funny and I can’t help but laugh when I see her stomping in her crib. But that’s caused poor Bunny to be the receiver of our daughter’s wrath. She will literally swing Bunny around while holding onto the nummy. She’ll toss him to the other side of her crib and then crawl over and get him. Most recently she’s been actually throwing Bunny out of her crib. Once this happens, she’s even more upset because now she’s all alone. I’ve even gone so far as to give her one Bunny and then poke the second one in a back corner of the crib… but she’s caught on to that and will often toss the back up Bunny before evicting the one she’s holding. This is what happens when you throw something away without evaluating the consequences. 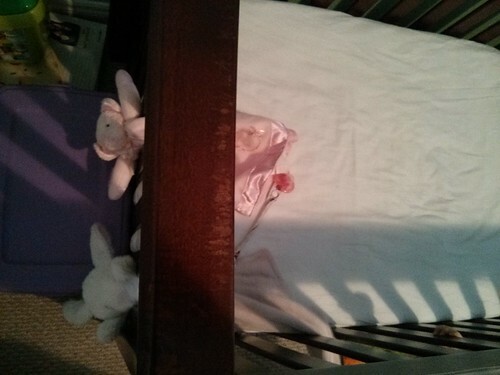 It seems that both Bunny and the bear have big heads that do not easily slip between the bars of the crib. Poor, poor Bunny. If you have seen a Bunny like ours, please let me know. I’m trying to track down one that’s exactly the same. The brand is Blankets and Beyond for Carter. 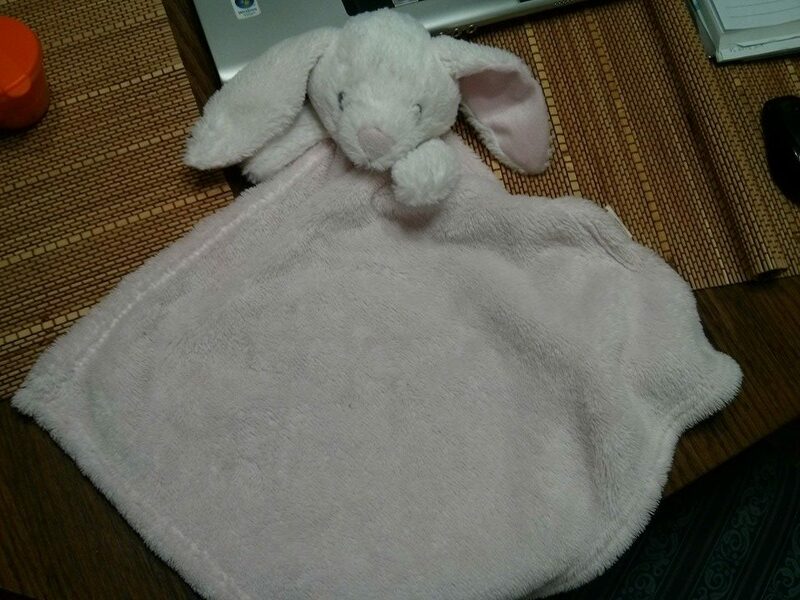 He does not have a rattle inside his head and his blanket is pink and his head is white with pink on the underside of his ears. We have a couple blanket bunnies that are similar, but I would really, really like to get another exact copy. Posted on January 6, 2014 Posted in 2014, Baby, Family, Holidays, Monday Musing, Ontario, Parenting, Toronto	. So this is my first Mommy Musing Monday for 2014. Keep your expectations low so that they’ll only get better. I have some draft posts in my head covering other topics, but those will come another day. This year for Christmas, we took Missy Moo to visit Matt’s family in Ontario. It was her first Christmas and boy were we busy! In addition to 12 fun days, we then returned home to have a second Christmas with my family. Between all of the excitement, I managed to let my guard down and my sinuses took advantage of the moment and held a coup… but I’m almost feeling 100%. Lots of people fly with offspring, including babies. I now have a better appreciation for anyone who does.